Life events often come in a series of three. For Richard and Annette Arnold, this was the absolute truth. In 1994, the West Sussex, England, dairy farmers were hit with terrible news, as were all producers, that the Milk Marketing Boards would soon disappear. The second life event was a painful decision to sell the farm. The third was a monumental choice to move to Canada and purchase a grain farm. The Arnolds were third generation dairy farmers from Billingshurst, the fifth largest civil parish in the Horsham district of southeast England. Going back further, there were three additional generations of Arnolds who were cheese producers. After returning to the farm fulltime with his parents Colin and Kathleen Arnold in 1986, Richard and his family managed 80 dairy cows and 300 acres of land, about 125 of which was routinely cropped. He sold hay for horses and earned income through custom seeding and hay making. Being a dairy operator was good business for Richard, with competitive prices as high as 52 cents per litre at times—12 cents above what he needed when factoring in his debt load. However, the Milk Marketing Boards dissolved in 1994 during Sir John Major’s time as prime minister, which effectively killed thousands of dairies across the country. Richard stuck it out and, along with about 60 per cent of the country’s dairy farmers, formed a cooperative dubbed Milk Marque to collectively market their milk. In 1997, after seeing an advertisement in Farmers Weekly about an upcoming seminar regarding farming in Canada, Richard decided to attend. He met and listened to Jack Nesbitt, a Hamiota, Manitoba real estate agent. Richard liked what he heard and in May of 1998, Richard, Annette and family came to Manitoba—in addition to stops in Alberta and Saskatchewan—to survey the Prairie landscape. They were satisfied and returned once more in November, with his parents as a support team, to make an offer on a house and farmland. So, in August 1999, the family made the life-altering decision to sell and jump across the pond to Canada once and for all. They had a few things going in their favour, too, including a favourable exchange rate of 1.8:1. They were able to purchase a 1,400-acre farm complete with a farmhouse due to the sale of his parents’ farmhouse and 12 acres of land. “The land values there are ridiculous. We’re only 50 miles from London and lots of people wanted to live in the country. The house was the big value—it was a biggish house—and we subsequently sold the rest of the land,” he says. In his first year of Canadian grain farming, crop rotations on the Prairies were fairly straightforward. Richard was a lifelong farmer, but a bit of a greenhorn when it came to Prairie practices—especially considering his landbase was now 13 times larger than his freshly sold UK farm. To start, he planted oats, barley, wheat, canola and a few peas. The first year the family had no income until the sale of their first crop. Richard hustled and worked at a feedlot, built pens and did other odd jobs to help make ends meet. He was also kept busy by the three feet of water that accumulated in their basement between the house offer and the day they arrived. “It gave us something to do,” he says with a laugh. But in order to survive, Richard had to be a bit of a gambler. Within two years of arriving in Manitoba, Richard had doubled his land base to 2,800 acres. All his land joins together in two blocks and today he farms 3,250 acres, plus seeds and combines 300, which is owned by his son-in-law William Thompson. “We took some pretty big risks and rented land when nobody was renting it. We didn’t make a whole lot of money, but always put food on the table,” he says. Over time, Richard was able to purchase and upgrade equipment. 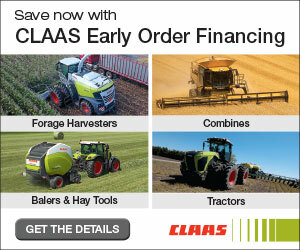 In 2007, he bought himself a New Holland CX 8070 combine; a sterling machine with a European design philosophy. “It’s a machine that is built to feast on winter-sown crops,” says Richard, which is what most European crops are.” Because of that, by the time summer harvest rolls around in the EU, a CX combine utterly devours plants. The CX is a high-capacity machine built to handle lots of straw, and that makes it an attractive combine in Western Canada as Prairie farmers are able to put high volumes of plant matter through it. “Canola still has green in it no matter what,” says Richard, who suggests canola will routinely cause plugs whether it’s swathed or straight cut. Sure enough, Richard’s became plugged up as he combined a field of canola during harvest 2009—not a particular surprise, but a definite nuisance. He grabbed his New Holland-issued reversing wrench and opened up the side of the machine. “I put the wrench across my shoulder and I stood up under it, that pushed my collarbone down; it dented my collarbone. That, in turn, pinched a nerve in my neck and I had nerve pain down my right arm and hand for over a year,” he says. His son Doug, 30, was worried about his father, and, also frustrated by the Luddite lever given to remedy a plug on their six-figure machine. 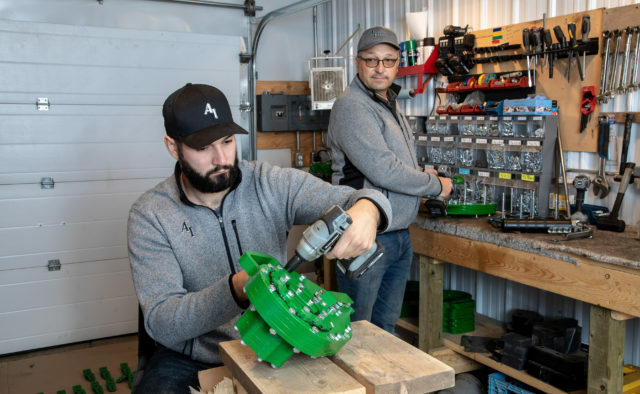 Doug, with a self-taught background in product and mechanical design, together with Richard, set out to create a tool that would remedy their hampered harvester. Through many design trials and schematics, they created their very own combine reverser. The way the reverser worked on the New Holland CX combine is like this: Open the concave, open the stone trap, attach the reverser onto the cylinder where the regular de-slug wrench would go and turn on the supply valve; then, using the spool valve located under the combine steps, you operate the reverser forwards and backwards. You do this until blockage is gone, and then, keep the reverser in the lowered position, turn off supply valve, remove the reverser, put it into its cradle, close the stone trap and you’re safely back to combining. 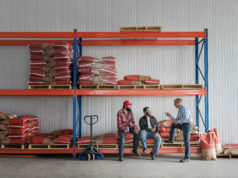 Some of their customers have reported successfully unplugging a canola blockage in as little as three minutes by themselves. Given the fact that Doug has heard of farmers trying multiple, dangerous techniques to get up and running again—such as pulling with chains attached to a truck or dropping out all the concaves and cutting out material with a reciprocating saw—he’s confident their reverser is a choice alternative. A large part of the design scheme was to ensure there wouldn’t be any more pinched nerves or injuries, whether to Richard or another farmer. 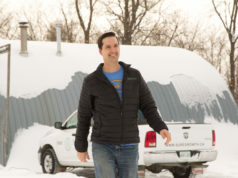 During the rough winter of 2016, many Prairie farmers, particularly in parts of Alberta and Saskatchewan, dealt with endless amounts of snow and rain, yet many still tried to combine in the adverse conditions. In 2016, the first full year of production, they sold 55, followed by 89 in 2017 and were on pace to sell 150 in 2018. The target for 2019 is 200, a goal Doug is fully committed to achieving, partly through expansion into Eastern Canada and certain U.S. states such as Nebraska, the Dakotas and Montana as well as rice country in Arkansas, California, Louisiana, Mississippi, Missouri and Texas. 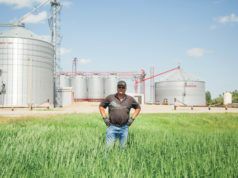 In the U.S., Doug is eager to talk to farmers that typically plug up with canola, linseed and rice. The first product was for the New Holland AI100 CX combine. To date, they have reversers for seven combines across John Deere, Lexion and New Holland brands. Unlike many iron products today, this is 100 per cent made in Canada. The metal is cut by nearby Hutterites at Hidden Valley Manufacturing and Doug assembles the product at the family’s farm shop. “The product isn’t cheap by any means, but it’s made well. It’s probably over-engineered. It’s more built like a tank and built to work almost a lifetime,” says Doug. The reverser, which comes with a one-year parts and labour warranty, will cost a farmer between $3,700 to $4,475, depending on your combine. However, it’s money well-spent, according to Doug, especially when harvest is on and the window to bin a good crop closes fast. Doug pounds the pavement and can be found at major Canadian farm shows in Western Canada, and has started to make inroads into Eastern Canada. The feedback they have received on the innovative tool has only fueled Doug more to continue reaching farmers dealing with combine blockages and strained shoulders. “It’s been really positive to the point where people come and find us [at trade shows], thank us for it and tell us how well it’s worked. They’ve been really happy with the product,” he says. The family is working on reversers for at least two more popular combine models and have additional ideas that are in the early stages of development that they hope will solve other issues in the agriculture industry and beyond. “We want to see problems that are being overlooked and put products in place to solve those problems,” says Doug. For Richard and his family, he didn’t necessarily have aspirations to be an ag entrepreneur, but when opportunity knocked, he was willing to answer. He credits his Christianity as the primary driver of his confidence in both the family farm and business. Beyond farming, one day Richard would like to be involved more in helping homeless people and giving back, something he did for eight years as a rural councillor in RM of Hamiota from 2006 to 2014.